Chicken Bastilla is Morocco's famous chicken pie. Delicious saffron chicken, spicy omelet stuffing, and crunchy fried almonds sweetened and flavored with orange flower water are layered within a crispy, paper-thin pastry shell. A garnish of powdered sugar and cinnamon adds to the savory blend of flavors. It does take some time to make bastilla, but each step isn't difficult. The following photos will show how to assemble and decorate the bastilla. First, you'll need to make the fillings. Follow the instructions in the Chicken Bastilla Recipe. Follow the Bastilla Recipe to make the chicken filling, egg stuffing, and almond topping. You can make the chicken and eggs a day in advance of assembly, but it's best not to mix the fried almonds with orange flower water and sugar until you're ready to put the ​bastilla together. Set up a work area with your pastry dough, a beaten egg yolk, and about 1/2 cup of melted butter. This photo shows Moroccan warqa (also spelled oarka), but you can also use phyllo dough. To assemble bastilla, first, you need to arrange a bottom layer of pastry. Using a large round oiled pan or platter as your guide, overlap several single sheets of Moroccan warqa, or double sheets of phyllo dough. Allow excess dough to drape over the sides of the pan or plate. Each time you use a sheet of dough, brush it with melted butter before placing another layer of dough on top of it. Cover the bottom layer of pastry with the saffron chicken filling. Distribute the egg stuffing over the chicken. Cut a single circle of warqa or a double circle of phyllo, and place it atop the eggs. Brush the pastry layer(s) with butter. Spread the fried almond filling over the pastry layer. Now you'll be wrapping the layers of dough up around the filling, and adding a few more layers to smooth and shape a nice bastilla. Enclose the fillings by folding the excess dough from the bottom layers up over the almonds. As you fully enclose the filling, fold and crease the dough where necessary to maintain a circular shape. If the folded up dough seems too bulky, trim off some of the excess. Spread butter across the top of the folded dough. Add overlapping sheets of warqa (use double sheets of phyllo) to make a smooth top for the bastilla. Remember to butter each sheet of dough. Gently fold the excess dough down around the sides, tucking the ends under the bottom of the bastilla. You'll find you can smooth and mold a circular shape as you do this. Brush the top and sides of the bastilla first with melted butter, then with the beaten egg yolk. The bastilla is now ready for baking, refrigerating overnight, or freezing. Cover the bastilla well with plastic wrap if baking at a later time. Preheat an oven to 350° F(180° C). Oil a baking pan or sheet. (A flat or very shallow pan allows for easy transfer of the bastilla once it's baked.) Bake the bastilla until it's crisp and deep golden brown, about a half hour if the bastilla was room temperature, but longer if the bastilla had been in the refrigerator or freezer. Carefully transfer the baked bastilla to a serving plate. Generously dust the top of the bastilla with powdered sugar. 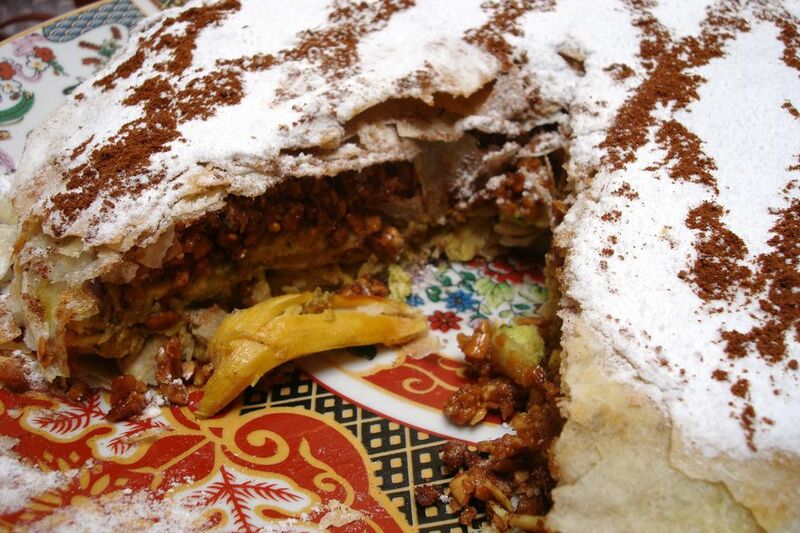 Decorate the top of the ​bastilla with ground cinnamon. To make lines, pinch small amounts of cinnamon with your thumb and forefinger, and release the cinnamon bit by bit. Once decorated, the Chicken Bastilla is ready to serve. Moroccan tradition is to gather around the bastilla, with each person eating from his own side. You can serve slices of the bastilla if you prefer.